Effective January 1, Dr. Eve Stringham, Associate Professor of Biology, was awarded a Canada Research Chair in Developmental Genetics and Disease, sponsored by the Natural Sciences and Engineering Research Council of Canada (NSERC). On February 20–21, the first of a series of five public symposia was held, titled “Faith Forward: Exploring Religion, Culture & Conflict,” and featuring Muslim theologian Shabir Ally and writer and actor Nelofer Pazira. Faith Forward was a partnership between TWU, Omni Television and professors Jens Zimmerman, Paul Rowe, and John Dyck. On March 1, Josh Howatson, a member of the TWU Spartans volleyball team, was named CIS player of the year and winner of the Dale Iwanoczko Award for excellence in volleyball, academics, and community involvement. In February he had been awarded the Premier’s Award as the top male volleyball player in BC. TWU’s new digital welcome sign — located between the Welcome Centre and Mattson — was unveiled in March. TWU’s School of Business launched an MBA program, under Acting Dean Andrea Soberg. An International Business Specialization option was added in 2008. Trinity celebrated the grand opening of the Trillium Native Plant Garden, located adjacent to the parking lot behind the Neufeld Science Centre, on March 21. On September 12, the University and the Department of Athletics officially launched the new Spartans logo [pictured right], featuring a stylized version of a more historically correct helmet. On September 13, construction crews from Directional Drilling began the estimated six week long drilling project to hook the University up with the Township of Langley water supply for the first time in forty-five years. One of the greatest gatherings of Dead Sea Scrolls scholars took place at TWU October 11-13 as TWU hosted the 2007 Dead Sea Scrolls Symposium. In October, for the second year in a row, TWU received an A+ grade in the Globe and Mail's University Report Card for its quality of education. The annual report surveyed more than 43,000 students from fifty-three of Canada's universities, asking about everything from students’ overall satisfaction to food and housing services. Ben Farrant memorial bench was unveiled near TWU’s Aviation Memorial on November 6. Farrant was an alumnus and one of the founders of the Wellspring Foundation in 2003. Dr. Eve Stringham’s Natural Sciences and Engineering Research Council of Canada (NSERC) Canada Research Chair in Developmental Genetics and Disease Inaugural lecture, “Of worms and men: What model organisms tell us about human disease,” took place on November 8. At a meeting on December 7, 2007, the B.C. 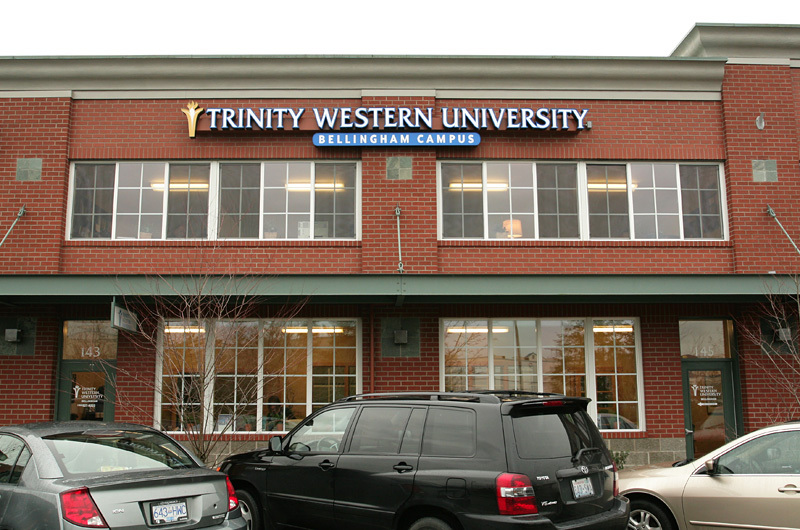 College of Teachers approved TWU's proposed Secondary Stream B.Ed. program, making it possible for the School of Education to begin its Secondary Stream Professional Year B.Ed. Program in September 2008. This approval also allowed the School to offer a two-year post degree program to students who had completed their B.A. or B.Sc. degree at other institutions, and were interested in teaching at the secondary level.